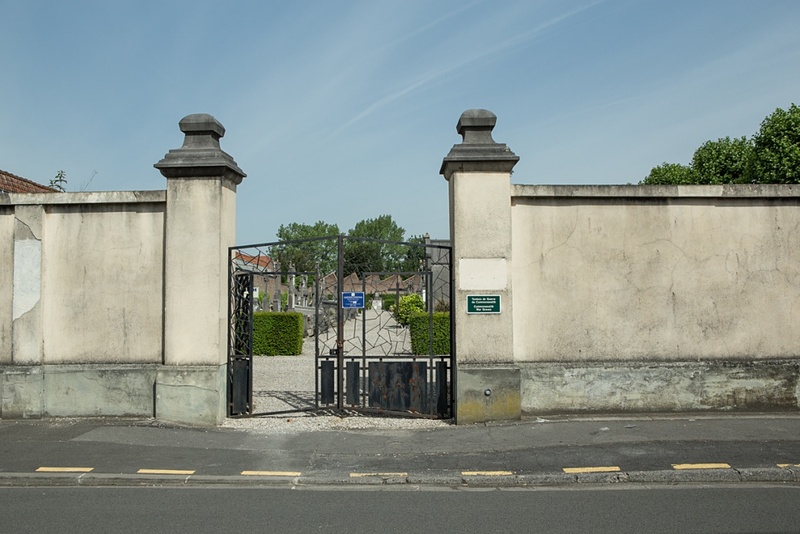 Wervicq (Sud) is a village on the Belgian frontier 16 kilometres north of Lille and 6 kilometres east of the town of Comines. 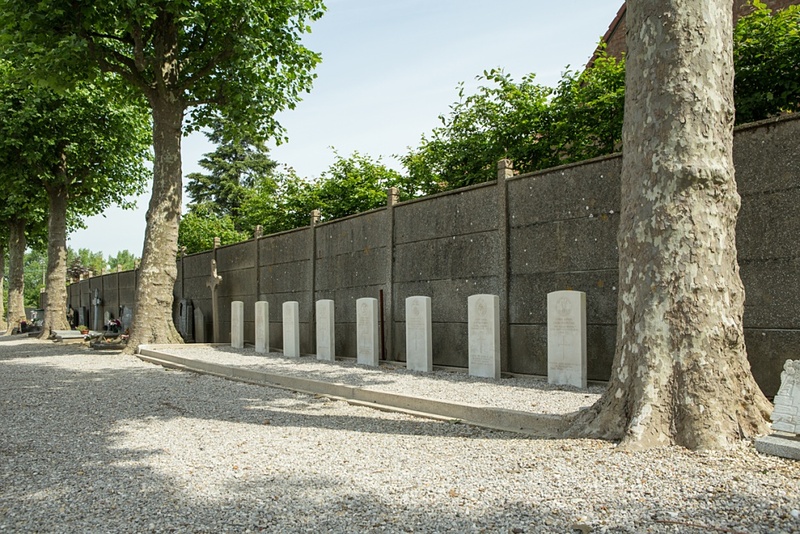 The Communal Cemetery is on the western side of the village and in the north-eastern part of the cemetery, close to the eastern boundary wall, are the graves of 9 soldiers from the United Kingdom. 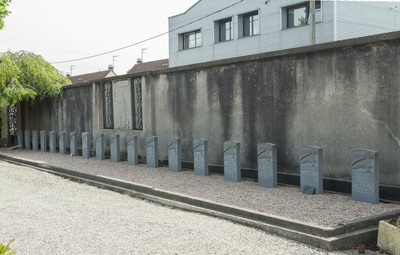 One of them is not identified. 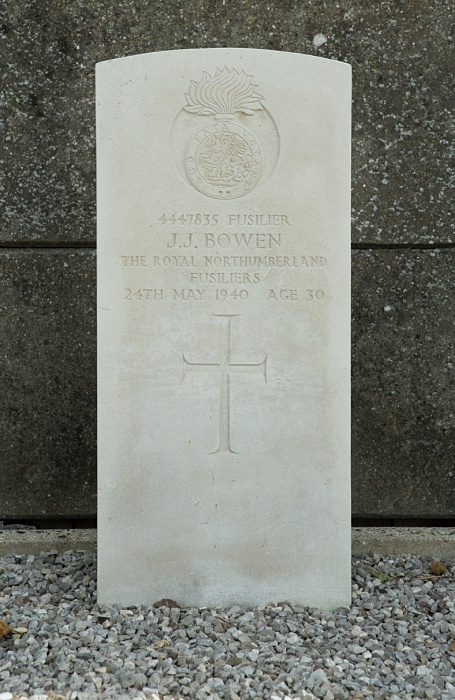 4447835 Fusilier John Jospeh Bowen, 2nd Bn. 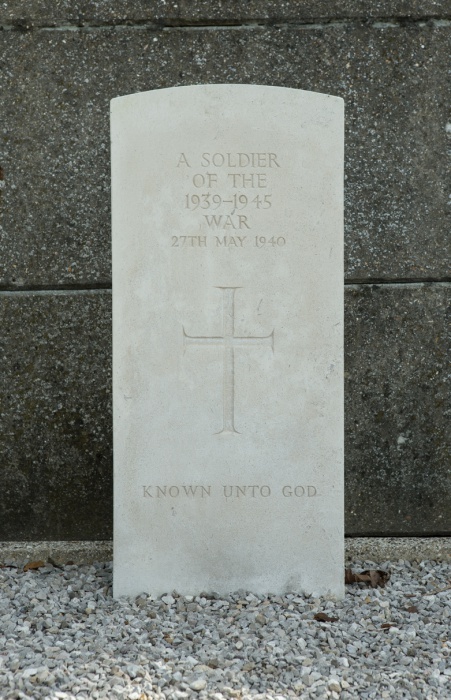 Northumberland Fusiliers, died 24th May 1940, aged 30. 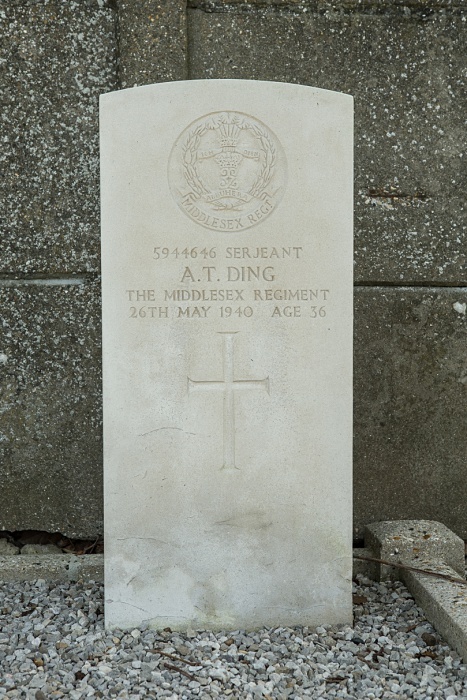 5944646 Serjeant Alfred Thomas Ding, 1/7th Bn. 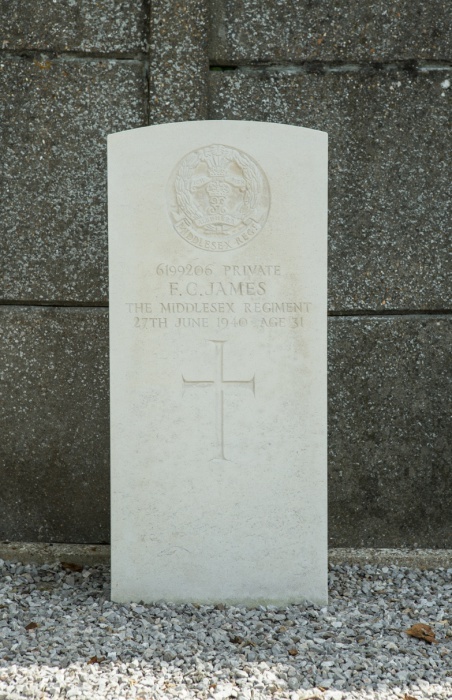 Middlesex Regiment, died 26th May 1940, aged 36. Husband of Helen Ding, of Hornsey, Middlesex. 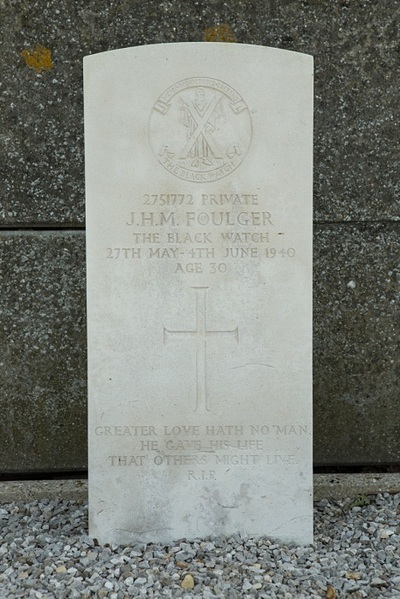 2751772 Private Joseph H. M. Foulger, 6th Bn. Black Watch (Royal Highlanders), died between 27th May 1940, and 4th June 1940, aged 30. Son of Joseph and Sarah Ann Foulger; husband of Lovain Francis May Foulger, of Erdington, Birmingham. 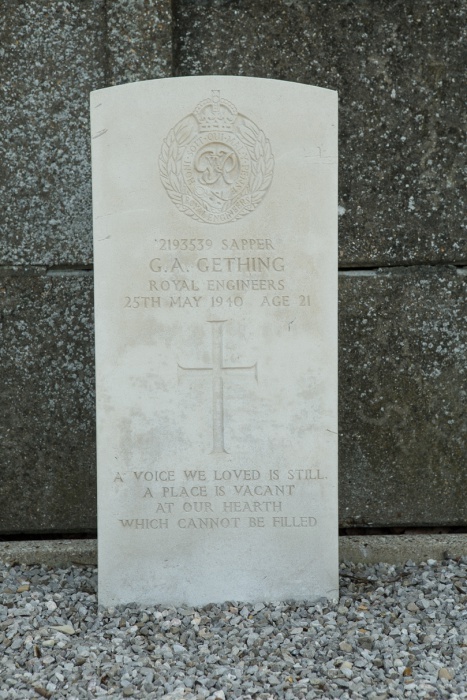 2193539 Sapper George Annis Gething, 18 Field Park Company, Royal Engineers, died 25th May 1940, aged 21. Son of Arthur and Elsie Mary Gething, of Yardley, Birmingham. 6199206 Private Frederick Charles James, 1/7th Bn. 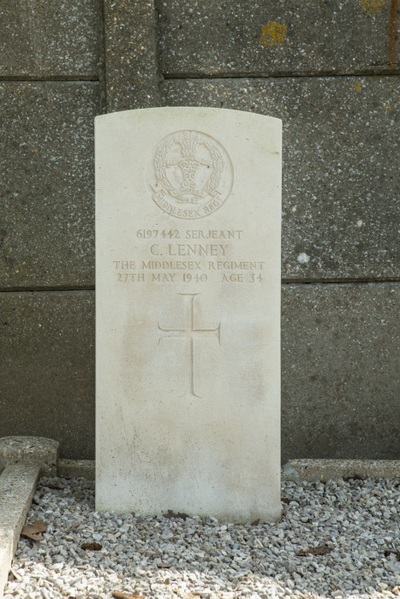 Middlesex Regiment, died 27th June 1940, aged 31. 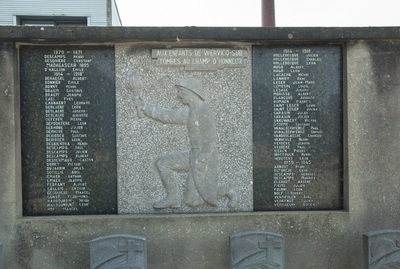 6197442 Serjeant Cyril Lenney, 1/7th Bn. Middlesex Regiment, died 27th May 1940, aged 34. 6209759 Private James Francis O' Sullivan, 1/7th Bn. Middlesex Regiment, died 28th May 1940, aged 21. 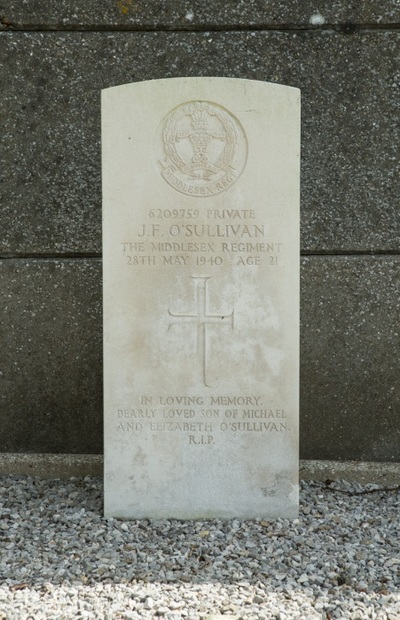 Son of Michael and Elizabeth O'Sullivan, of Paddington, London. 2750638 Private William Wallace, 6th Bn. 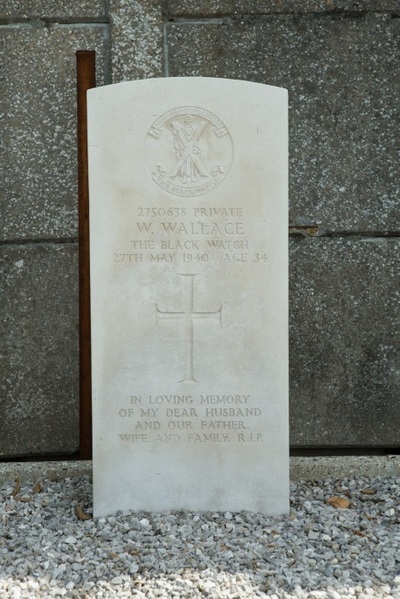 Black Watch (Royal Highlanders), died 27th May 1940, aged 34. Son of William and Mary Wallace; husband of Catherine Wallace, of Perth.